Often clients can’t wait for the completion of a fixed-rack exposure program – results and indications of material performance are required much sooner. Allunga offers several accelerated exposure options – Altrac, Tracrac, Seasonal Angles, TNR exposures and Salt-Spray testing. These services allow clients to fast-track exposure testing, and get reliable indications of long-term performance in a fraction of the time. Altrac units use a fresnel-like array of 10 mirrors focused onto a target zone, and the units rotate during the day tracking the movement of the sun. Altrac units meet the requirements of ASTM G90. Altrac units allow concentrated exposure to the natural solar spectrum. A specially designed pyranometer sensor measures radiation in the target area. On clear sunny days the acceleration factor, in radiation terms, may reach 900%, while the long-term acceleration factor is within the 450–550% band. During evenings and cloudy periods the target area can rotate allowing Tracrac-like exposure (with prolonged natural moisture exposure). Surface temperatures of exposed samples are regulated with fan driven forced-air draughts. Altrac Options include programmable water spray cycles and under-glass exposure. The size of Altrac samples is limited by the dimensions of the target area: 130 mm x 1800 mm (samples may be up to 150 mm in width, though only 130 mm will be exposed). Small, irregular or non-rigid samples may be tested satisfactorily by fixing to a suitable backing or support frame of the appropriate size. To view this movie, please ensure you have the latest Flash Player. 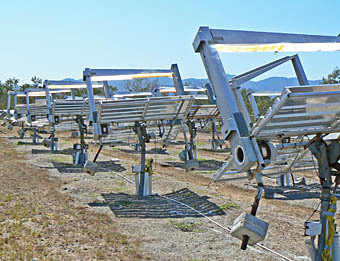 Tracrac units rotate during the day to follow the sun so that exposed samples maintain a normal solar incidence position. This presents the maximum possible sample surface area to the sun at all times, and results in approximately 40% more incident solar radiation than that received on a fixed rack at 19°. Aside from increased radiation exposure, Tracrac samples recieve the same climatic exposure to moisture and temperature variation etc as do fixed-rack exposures. Tracrac exposure costs comprise the normal fixed-rack costs with a small per-panel surcharge. Seasonal-angle exposures use fixed racks with the inclination adjusted seasonally. During the (calendar) summer the inclination is set to 5° from the horizontal, during periods centered on the equinoxes the inclination is set to 19°, and during the (calandar) winter, inclination is set to 35°. This results in a net gain in incident solar radiation of approximately 10~12% over a fixed rack at an inclination of 19°. The cost of seasonal-angle exposures is currently the same as fixed-rack: no additional costs are involved. This is excellent value for a mildly accelerated test with excellent correlation values. Like Tracrac, Seasonal Angles exposures although receiving mildly accelerated radiation exposure, using the natural spectrum, are also exposed to the natural moisture and temperature variations.